Cats love their routine, their comfort, and their territory. 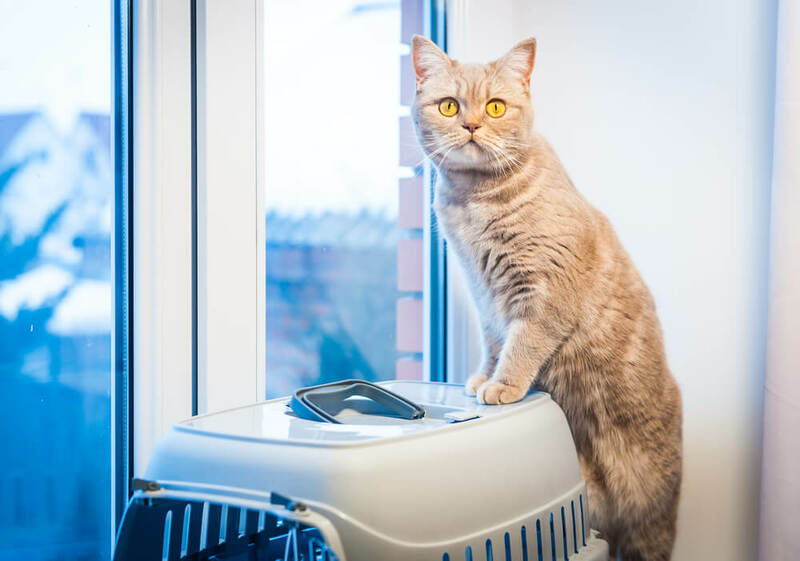 It is completely opposite to the purpose of cat carriers in which you break your cat’s routine, to take them away from their comfort and territory, when you are moving house with your cat, or going on a trip to the vet, for instance. No wonders cats are often reluctant to enter their carrier! However, there are ways to make your cat change opinion about their carrier. Moreover, we provided a few tips on how to travel with your cat. See how our modern life differ from our cats’. First, you need to choose a proper carrier. Not a teeny tiny thing your cat barely fits in. No, it must be large enough, have large openings to let the cat breath and be easily cleanable. Carriers of all sizes and shapes exist, so make sure to pick the best one for your feline friend. Now you have a proper cat carrier, we shall go to the next step: putting your cat in the carrier. This requires a little patience, but tricks and training are key to travel with your cat. This is a complex and long process. So make sure you train your cat to be comfortable with every step separately before moving on to the next one. Cats must not associate the carrier with negative experience. To avoid that association, you may place the carrier somewhere your cat can explore, and put some of your cat belongings in there, such as their bedding, for familiar scent. Therefore, the carrier will not be associated with vet visits, or travelling. The familiar scent will reassure your cat when they are in the carrier, and make them more comfortable. You may also use FELIWAY CLASSIC Spray to make the cat carrier a happy place. Rewards given after the behaviour you expected from your cat, paired with a sound - either a marker word, or a clicker for example - can help cats link the behaviour they performed with the reward. Also, you will see your cat will be anticipating the reward with repetition. Keep to the same routine : first the cat enters the carrier, then you give the reward. It is better for long term acceptance. After some time, you will be able to reduce the rewards. Though is it not the best way to do it, if your cat is still not keen on going into the carrier, you may try to lure them with a toy for example. Avoid playing or it could cause too much excitement and prevent your cat from entering the carrier. When your cat is fully comfortable with the carrier, you need to teach them to be relaxed when it is closed. In that case too, rewards can help you and your cat achieve that stage. If your cat shows any signs of discomfort, or looks distressed,stop the session immediately, and give your cat a break. Training sessions must remain short. Blocking your cat’s view, with a blanket laid on top of the carrier for example, can help reassure them. When your cat is relaxed in the carrier with the door closed, then you can carry on to the next stages: lift the carrier, and walking with the carrier. Having a cat relaxed in a carrier is a good start, but then comes the car. And it is a brand new level for your cat. It can take quite a long time to accustom your cat to the car. Here again, before you get to travel with your cat, it will require you to split steps, and keep to short sessions. However, when it comes to travel in the car, the length of the sessions will increase gradually. When you reach the travelling part, avoid food rewards since it may cause your cat to vomit. 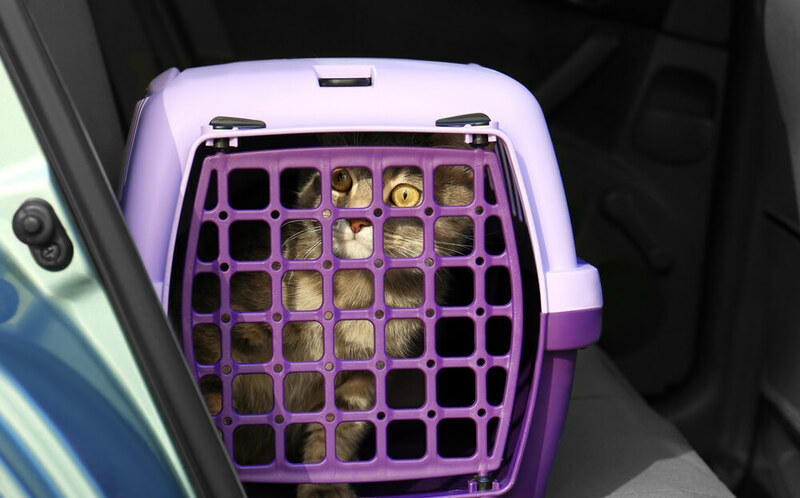 Besides the fact you want to make your cat enjoy the trips you will take them on with you, never forget to secure your cat with a seat belt to avoid movement the best you can, and to protect them from too much sun or heat in the car. Travelling with a cat can be worrying. Read Charlie and Bird's story and see how FELIWAY CLASSIC Spray helped them go through Bird's hate of travels. And subscribe to our blog and watch the videos made in partnership with International Cat Care to make your cat the purrfect travel partner.